Teradata Corporation(NYSE: TDC), the big data analytics and marketing applications company today announced that nominations are being accepted through May 25, 2016 for the 9th annual EPIC Awards. Sponsored by Teradata, EPIC Awards recognize Teradata customers and partners for delivering extraordinary business value and competitive advantage by effectively using data analytics. Government agencies are evaluated based on their ability to effectively address constituent needs. 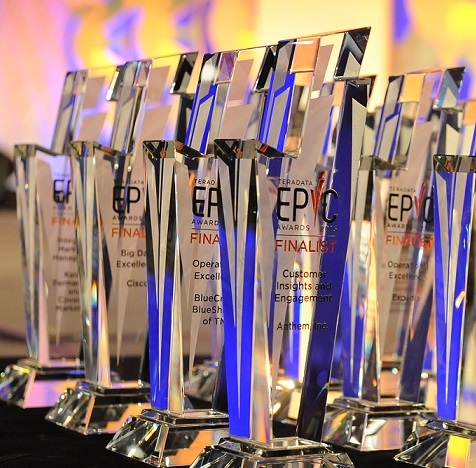 This year, an important new category has been added to the EPIC Awards roster: “On the Edge with IoT.” The Internet of Things represents increasing potential to use data and analytics for competitive advantage as well as the greater good by capturing and leveraging data from telematics and interconnected devices such as vehicles, meters, machines, weather devices, buildings, manufacturing lines, and shopping carts. This emerging breakthrough business application can monetize the industrial Internet of Things by changing business models, improving processes, exploiting new technologies, revolutionizing healthcare, or enhancing the customer experience in new ways. EPIC Award winners are announced and celebrated at the Teradata EPIC Awards ceremony which will take place this year as part of the Teradata PARTNERS Conference in Atlanta, Georgia on Monday evening, September 12, 2016. Eligible customers are those businesses or government agencies that have implemented a solution based on any Teradata product or Teradata Aster analytic platform. Teradata Global Integration and Consulting Partners (ICP) or independent software vendors (ISVs) that have completed an implementation with a Teradata customer may also be eligible for recognition with the customer. Nominations for customer categories must ultimately be submitted by a customer, either on their own or through the customer jointly with a partner. Independent judges will evaluate customer nominations and determine winners and finalists based on the implementation’s demonstrated strategic importance and impact to the business. Partner winners and finalists are determined by a panel of Teradata judges.